Tim Mais was one of dozens of people helping stranded drivers on Thursday. Unplowed streets throughout the day made it difficult for service vehicles as well as cars. All along the Metcalf corridor, stores closed and sent employees home. A day of municipal mayhem is winding to a close. The Kansas City Star’s Eric Adler writes that the whiteout of February 21, 2013 is a “100-year storm,” according to the record books. Many officials and citizens would probably agree. The morning started with a snow dump. Some areas got several inches in several hours, according to the National Weather Service. I headed out to work about 9 a.m., unable to see the sides of my street. The snow was blinding, but the accumulation also made it impossible to see where the street ended and the shrubs began. About a mile from my house, I slid into a drift. Almost immediately, a handful of folks arrived with a shovel and people-power to push me out. What happened to me was happening all over the city. I must have seen dozens of abandoned cars, snow blowing into angular artwork over their windshields and around their tires. 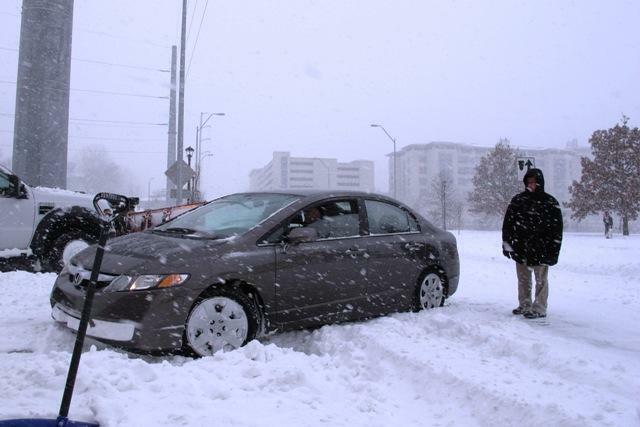 But the silver lining: Everywhere people were helping drivers dig, push or pull out of snow banks. Tim Mais was on his way to a “movie day” with friends when he saw Eric Johnson stuck on Mission Road. Mais unsuccessfully tried to shovel the car out, and ended up going to get his truck and tow line. Transportation officials warned people not to wander from their cars, but people did it anyway. Many ramps on and off I-70, I-35, and I-435 were closed. Where open, traffic snaked along the highways, bumper to bumper, as people flooded home from offices and shops that closed midday. You know it's bad when the host of Up to Date needs a push into the parking lot at KCUR.